The Troodos Mountain range reaches elevations of over 6,400 feet (1,952 meters) above sea level at Mount Olympus and spans across the majority of southwestern Cyprus. Over two dozen villages developed in the mountains along with nine churches and one monastery. Journeying into the mountains brings guests face to face with quaint communities having traditional buildings and cobblestone streets. Rich in agriculture, the area often features terraced land boasting vineyards. Fruit and nut trees also thrive here. The mountains attract locals and visitors all year long. During the summer months, the cool air in the upper elevations provide welcome relief from the heat below. Mountain retreats during August remain part of a long historic tradition among the locals. The winter months bring snow and vast numbers of avid winter outdoor sports enthusiasts. The scenic region serves as home to over 600 species of plant life including the native Calabrian pine and the Golden oak trees. Wildlife in the mountains ranges from numerous bird species that include the Bonelli’s Eagle to a variety of small mammals. The mountains have the Machairas National Forest Park in the Pitsilia region and the Troodos National Forest Park. The latter park encompasses over 22,600 acres (9,147 hectares) around the Mount Olympus area. Both destinations provide the perfect environment for hiking, biking, camping and picnics during the warmer months. The 3 kilometer trail near the Psilo Dendro Trout Farm to the Caledonia Falls is one of the most frequented treks on the island. Though the route is relatively short, the journey meanders back and forth across the Kryos Potamos River multiple times via special wooden footbridges. After reaching the falls, the trail continues along the left side of the cascading water and travels upward steeply. A decent pair of hiking shoes ensures safety along the slippery route. Kakopetria is one of the charming villages nestled within the mountains. The residents welcome guests and willingly share their culture and heritage, which includes handcrafting furniture from straw and wood. 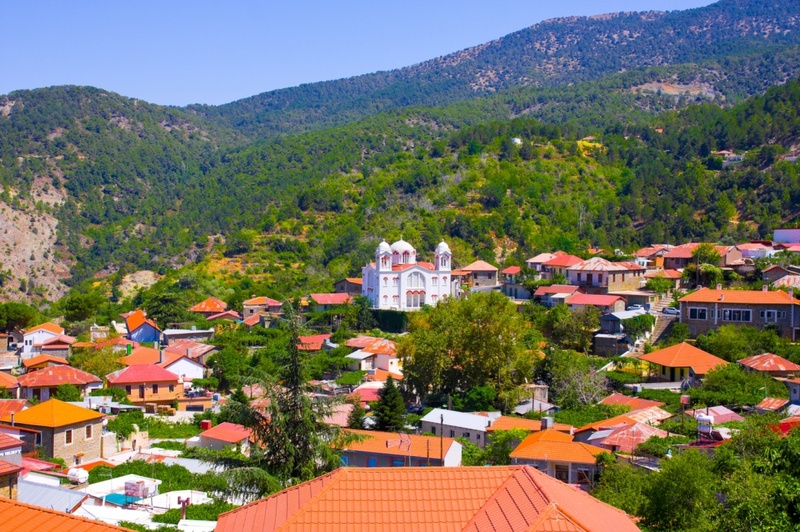 The destination features a number of churches including the renowned Agios Mickolaos tis Stegis. The beautiful facility attracts many who venture here to see the array of hand painted murals that date back to the 11th century. Pedhoulas is another popular village frequented by visitors. The location becomes a picturesque sight when the cherry trees bloom. Many also journey here to visit the medieval Church of St. Michael. The famous Kykkos Monastery and museum is another destination favored by guests. The fascinating museum contains artifacts dating from 2,500 B.C. The most famous relic contained within the complex is a painting of the Virgin Mary, supposedly painted by the Apostle Paul. For the last 5,000 years, the people of the mountains specialized in wine making. The wine country predominantly lies on the southern slopes of Krassochoria and Koumandaria. Guests exploring the local landscape inevitably encounter vineyards, wineries and tavernas. The 'Cyprus Wine Routes' provides guests with the opportunity of seeing the spectacular area with the possibility of visiting and touring local facilities. Find information about selected Hotels, apartments and rooms in Troodos to choose the perfect place for your accommodation.